13VG1040ASIR-SQ from Tamron is compatible with almost all Day/Night cameras. It corrects chromatic aberrations in both the visible and IR spectrum and offers high quality images in near infrared range. It also features built-in slip mount mechanism, multi-layer coating and an environmentally-conscious design. 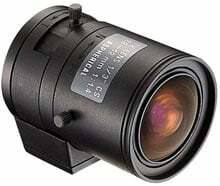 The Tamron 13VG1040ASIR-SQ is also known as 13VG1040ASIR-SQ	or 13VG1040ASIRSQ	.